The great thing is that these tactics will only save you money. Consider a quick marketing budget audit as a way to respect the things that are working, and say goodbye to the ones that aren’t, no matter how they performed in the past. We’ll show you where a lot of budgets these days aren’t performing to standard. We’ll also give you some suggestions on where to diversify instead. Let’s start by putting this out: if trade shows work for your business, then stick with them! However, if you’re like most companies these days, you’re seeing a decrease in customer buying decisions that start from trade shows. Even if you see a few leads and the rare customer conversion from a trade show, are you bringing in more than you spent on them? Trade shows can be pretty expensive. Unless you just need to keep a public trade show presence, consider stripping some of the budget from trade shows and driving it towards other methods. The good thing about taking a break from trade shows is that you can always come back if you want to later. Unlike email marketing, which needs steady efforts, trade shows can be used or forgotten on a whim without changing outcomes. Pay per click can be extremely effective, especially if you find a niche that costs less but still has traffic for your business. Unfortunately, most businesses do not have the resources to use pay per click in the most effective way, which often leads to a smaller return on investment. Most kinds of pay per click work best on the medium scale where there are enough results to test effectiveness, but not so much that the additional returns drop significantly. If you’re in a highly-competitive pay per click market like legal, insurance, finance, and real estate, you will also be paying way more than other markets do per keyword. Don’t get ripped off in a bidding war with your competition. The only one who wins in that case is the pay per click company. When you consider dialing back your budget, take it one step at a time. See if a small budget decrease changes your profits without eliminating pay per click completely. The great thing about pay per click is that it isn’t all-or-nothing. You can choose your own level of involvement. While only about half of direct mail marketing ever gets read or opened by the recipients, it’s not entirely out of the picture. The general public still somewhat respects direct mail on the basis that any item received can be important bills and notices or coupons. The problem is that paper printing and paying postage is significantly more expensive than creating an online version of the same items. The main difference between direct mail and email marketing is price, and that fact can be taking more from your marketing budget that could be used elsewhere. Targeted email marketing is largely successful, as 94% of mailing that used to be done with direct mail is now done online! You can also add emails into a bigger picture connected with online content and promotion through inbound marketing, which offers some great alternatives that yield leads that statistically cost about 62% less each. Like most industries, yours probably has customers who need some education about products and companies before making a buying decision. After all, that’s what trade shows and sales calls are supposed to do: inform your audience about what you do. Educational offers like ebooks, whitepapers, and infographics can educate customers quickly and effectively. In them, you would simply create a guide on how to do something in your industry, or information for making a decision on certain products. These offers can be available permanently from your website. Because you buy each offer once from the creator, they become more cost-effective over time. Since they will contain information that your sales team would also convey, the leads these offers bring in will be more educated and ready to purchase. The offers aren’t even very expensive to create, so the risk is small if you skip a trade show to create a premium educational offer. As a force multiplier, promote your educational offers with blogs and social media as part of a new inbound marketing strategy. If your company isn’t already keeping a professional blog on its website, now is the time to start. By the numbers, blogging is extremely effective and very inexpensive. More than half of all companies have acquired new business from their company blogs, and maintaining a blog that meets industry standards is literally the least expensive method of mainstream marketing. There’s nothing wrong with just talking about your industry, but make sure that your blogs are helpful and useful insights from a professional. Don’t spend all your time talking about your brand, or else readers won’t stay. Create a blog that solves problems for people, and they will reward you with continued loyalty. The only expense of blogging is the initial cost of creation and publishing, but blogging works best in an inbound marketing strategy where the blogs lead to educational offers. Industry standards suggest using a unified approach where your blogs are part of a sales funnel where email, social media, and online downloads all work together towards a common goal. With social media promotion, your main expense will be paying a specialist to manage the social media platforms. Unlike many CRMs, social media interfaces are made to be user-friendly. This means fewer hours for your social media manager, and less cost for your business. According to the inbound marketing experts at HubSpot, internet users spend about triple the time on social media and blogs as they do on email. The takeaway? Your potential customers aren’t looking for you to send messages to them; they want to find you themselves on social media and blogs. Putting a little money into social media can go a long way, especially when integrated into your larger inbound marketing strategy. Make your educational offers, blogs, and social media promotion work together to yield an outcome greater than the sum of its parts. We all know that sometimes there are small fluctuations in marketing performance, but if you’ve seen a steady decline or an oversized budget in our fix-up section, don’t wait for them to change. With the shift to a customer-driven marketing world online, conventional marketing tactics are still decreasing in return on investment, and inbound marketing strategies have only increased in their place. 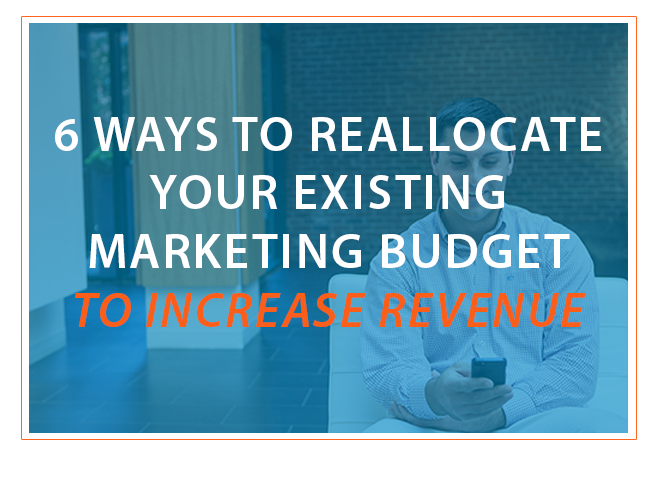 You're getting your budget in place, now how about your strategy? You probably already know what it looks like when you toss money at marketing tactics without a strategy -- you experience subpar returns on your investment. Get your strategy moving in the right direction. Grab a free sample strategy to see where gaps might be in your strategy.